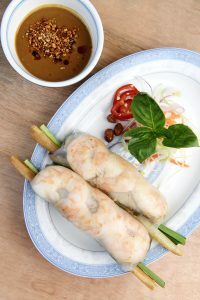 Roasted pork and poached shrimp spring rolls with peanut dipping sauce. LSXO is the dining darling that creates an instant inquisition when I utter its four-letter name. “Oh, I’ve been dying to try that place! Where is it?” or “I hear it’s like Club 33; how did you get in?” or “It’s supposedly impossible to get a table. Why haven’t you taken me?” are typical pleas. Color me confused. I didn’t pull secret strings, beg for a reservation, or get lost finding chef-owner Tin Vuong’s utterly unique inner sanctum in Huntington Beach’s increasingly high-end resort zone. I’ve logged several delightful meals at the nearly 2-year-old place, and I’ll return. The 38-item menu is packed with hyper-vibrant Vietnamese dishes weaving high-volume flavors into cuisine Vuong labels “home cooking with heart.” It’s the same fare you’ll find at Vuong’s three Little Sister shops in L.A. County. But none of them feels much like LSXO, short for Little Sister Extraordinary. Limited seating adds a note of exclusivity, and the decadent mood of French Colonial Vietnam is a sultry come-on you won’t get anywhere else in O.C. Custom wallpaper features M60 machine guns firing pastel butterflies that scatter overhead on golden-coffered ceilings—an eye-catcher to be sure. Add a soundtrack of vintage, uncensored West Coast rap to this parlor with genteel seating, and the resulting mashup makes an indelible impression. How nice that the mashup doesn’t extend to the food. No fusion fare here. This kitchen cooks with practiced confidence and never shies from intense flavors: funky, tart, incendiary, or garden fresh. Don’t expect to customize or alter dishes, because each is carefully composed to zero in on the intended result. If special requests are your thing, dine at Vuong’s mainstream Bluegold with its something-for-everyone menu, rap-free music, and staggering beach view. Ease into the quirky zeitgeist of LSXO with approachable starters: Try grilled pork and beef skewers exuding citrusy lemongrass; rich dumplings full of pork, crab, and shrimp splashed with spicy vinaigrette; or snacky red curry pork rinds that befit a first round of stylish cocktails. If I allowed myself, I would order the massive Vietnamese crepe enfolding prawns, pork belly, and bean sprouts on every visit. The bouncy bouquet of greens and herbs that accompany it offer cool contrast, so eat them; they’re not a garnish. Fans of green papaya salad should not miss this version with red Fresno chiles and bits of Viet beef jerky. Stacks of rice paper Imperial Rolls are everywhere, filled with pork, shrimp, crab, and glass noodles before being fried to a shattering crisp. They’re often suggested by servers, and they’re as good as you’ll ever have. Not fried and even better is the Autumn Roll, its cold wrapper bulging with crisp jicama, egg, herbs, sausage, and candied shrimp, each roll impaled with an even longer dowel of fried rice paper glued with pork and shrimp paste. Of course, the king and queen of proteins here are Shaky Shaky Beef and Salt and Pepper Lobster. I do like that these classic dishes have finesse many diners wouldn’t require of such expected dishes. Butter-sizzled shallots add richness and help the spices and garlic cling to the lobster shells, but be ready to do some digging and finger-licking for maximum lobster love. I’m a lazy shellfish miner, so there’s always leftover meat the kitchen gladly converts to lobster fried rice to take home on request. Tender filet mignon wokked with burnt butter soy is popular and delivers as promised, though filet is hard to make compelling. If I’m choosing, I’m all in for the lamb satay, eggy noodles, and mustard greens strewn with fried garlic. Most memorable is the red and black rice hot pot. 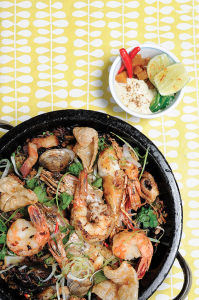 It sounds ho-hum, but it’s a vivid and huge dish with unending allure. Never overcooked mussels, shrimp, scallop, and octopus hold their own against pork confit and sweet-salty sausage. Every bite is unique, and the bottom rice layer is properly crunchy and flavor-soaked. 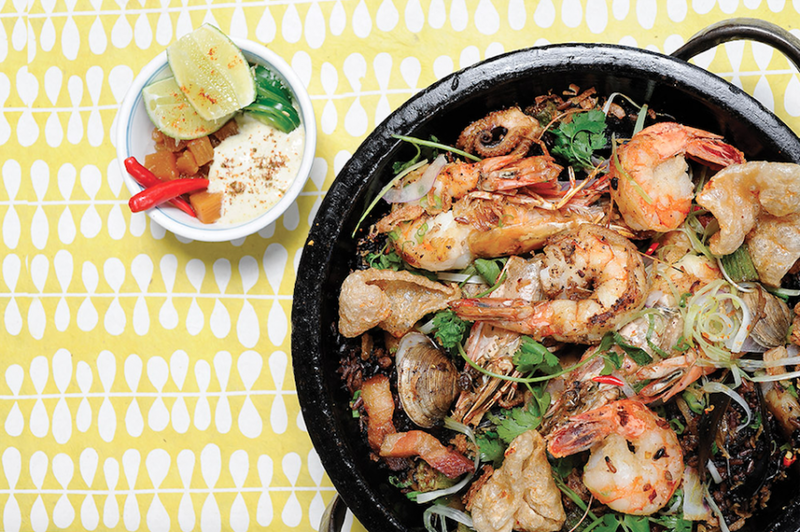 Lime-leaf aioli is a clever nod to paella. Unless you want leftovers, bring a group for this one. No matter your order, little pots, bottles, and bowls crowd the table, brimming with add-ons—such as duck egg or fried okra—or house-made condiments that deserve a spot on a retail hot-sauce shelf. Try everything and you might be surprised by how distinct each condiment is or how a spoonful can ignite a dish. Cocktails are balanced and au courrant, just what you’d expect from the $15 price point. What I didn’t expect was the refined selection of wines by the glass. Thanks to mothership Bluegold, LSXO diners can enjoy a glass of sancerre, gewürztraminer, or riesling. Forget dessert. The options are cribbed from Bluegold’s so-so list, and none are Vietnamese. When I hear folks whine about “overpriced, inauthentic” cuisine here, I roll my eyes, and you should, too. 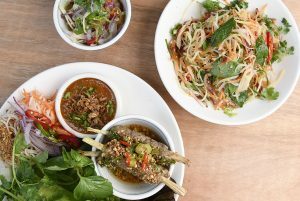 Yes, the menu includes big-ticket items, but it’s also peppered with affordable plates such as the stellar soft-shell crab banh mi, foie gras-buttered short rib toast, or Viet-style beef tartare. As for authenticity, Vuong is a frequent flier to Ho Chi Minh City, his base for stalking the foods of South Vietnam. He reports logging 11 visits in the past year. I’m not quite sure what box you’ll check if you go to LSXO, but for O.C., it’s one-of-a-kind dining. I mean, extraordinary. Getting there is as simple as Google Maps and Open Table. Plus, it’s a lot less hassle than a flight to Vietnam. FYI Parent Blackhouse Hospitality operates eight venues in L.A. County.